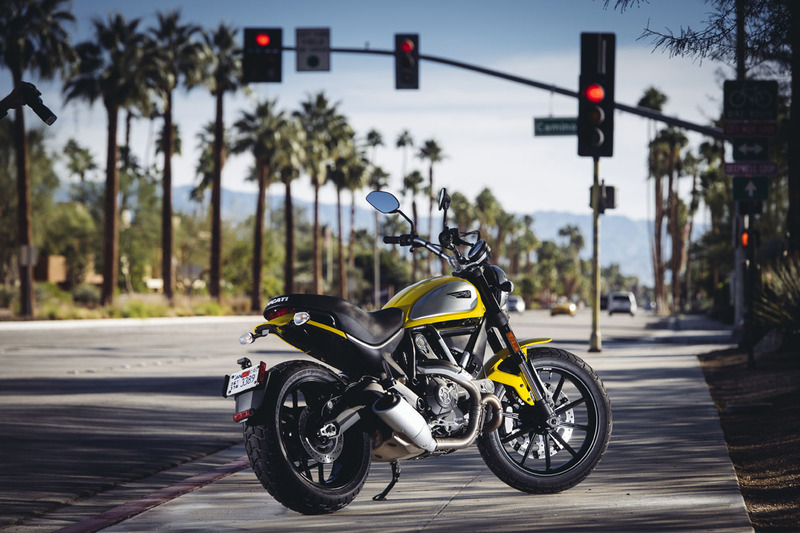 Scramblers may have been created in the early 20th century as all-terrain machines designed for racing with specific aims but Ducati have taken that concept and reinvented it, much as they did with their Streetfighter. 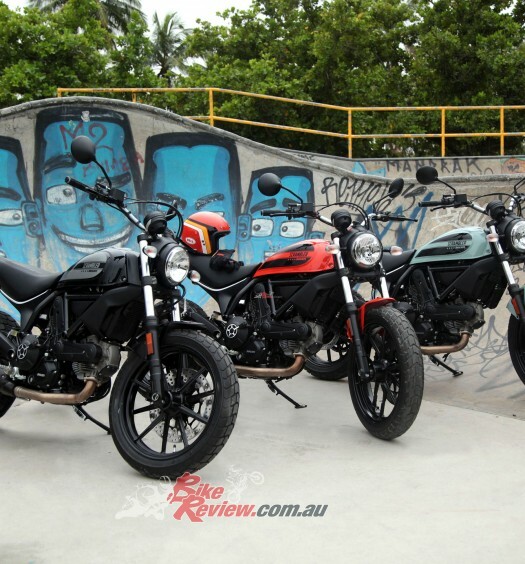 Indeed the Ducati Scrambler, which I first saw at the Bondi launch, follows many of the early scrambler queues – it’s light, with a minimal seat, plenty of torque, simple, with a small tank and chunky rubber. 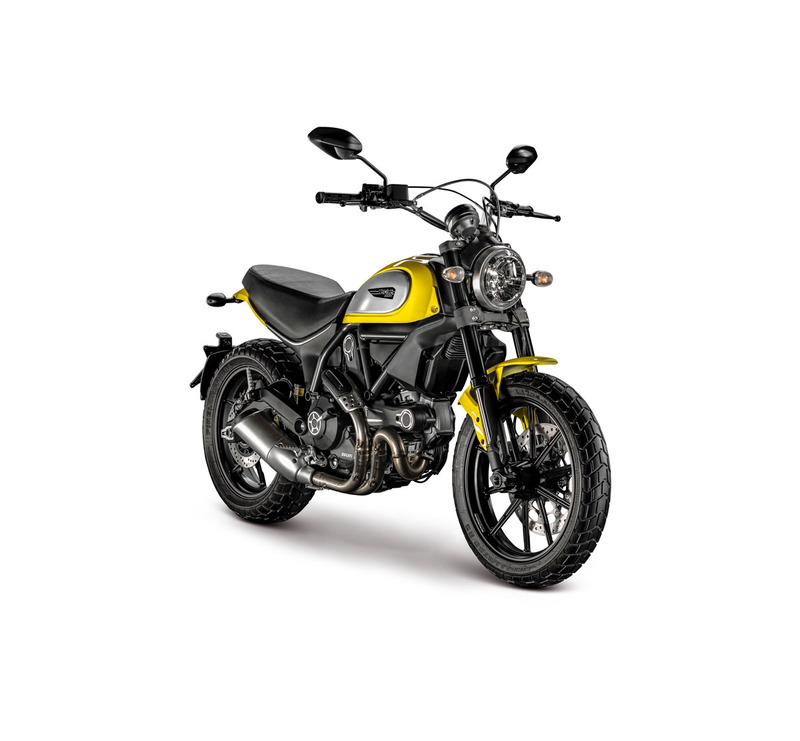 Spoked wheels are optional depending on the model you choose, but the Ducati Scrambler looks the business and has the appeal. I’ll also be the first to admit that images struggle to do this bike justice, there’s more to it than just looks, something that’s hard to define. It’s motorcycling stripped back to its basics, no rider aids (well except ABS) and with specs that again don’t reveal much about what you’re about to jump on board. 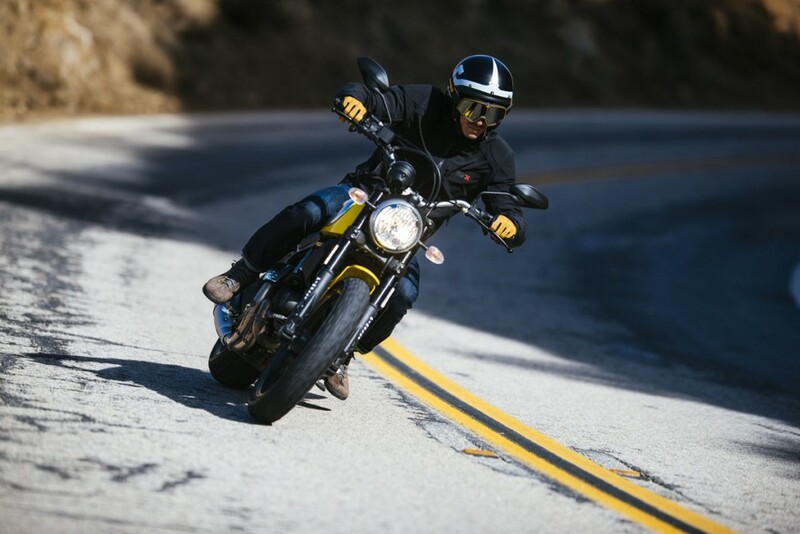 You’ll probably cop a bit of flack from the traditional custom scrambler crowd if you turn up on a Ducati Scrambler but manufacturers providing accessories to customise your bike is just a smart move, from their perspective they can keep taking your money and to the owner’s advantage the parts will be high quality, a good fit and don’t break your peace of mind if you’re new to customising. It’s a win-win. 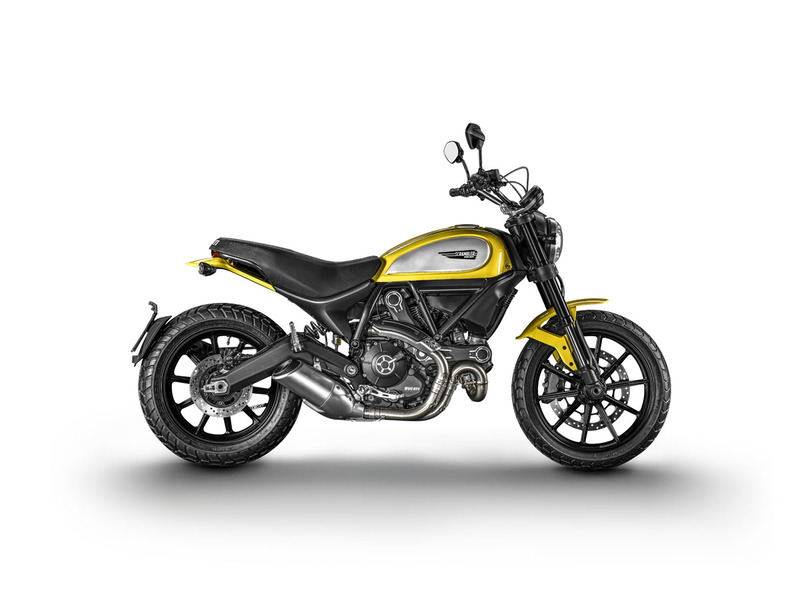 I’m also not into the whole hipster thing, which sure – is what they all say, but the Ducati Scrambler hype really misses the mark with me, which is a real shame because this is a really good machine and I think has the potential to reach a really wide audience of riders. Picking up the Scrambler ICON from Ducati HQ in Sydney I was a bit unsure what to expect, in person it looked bloody cool. The exhaust was neat, the engine cases sported cutout polished areas, and the knobbly tyres gave it some street cred right off the bat. Firing the bike up its note was pleasant but quieter than I’ve come to expect from Ducati. Working out the instruments and controls was also far quicker than on most Ducatis, I got on, spent five-seconds making sure everything was as expected and that was it. OK, those five seconds may have just been finding and kicking the stand up. Taking off the 803cc Desmodromic L-twin was generating plenty of torque and first gear was tall, meaning I didn’t feel the need to upshift straight into second, even taking off in a hurry. Slipping it into second was smooth and reassuring and opening the throttle had me pushed back in the seat, holding onto the bars to stay in place. OK I wasn’t expecting that, despite the 800cc engine. The single front brake consisting of Brembo four-piston caliper and a large 330mm rotor provided good stopping power but there wasn’t a heap of bite, with the rear brake likewise offering good slowing and stopping power but needing a really heavy foot on the lever. 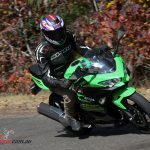 At first I felt like I was going to lock the brakes up but the pads may just have less bite or been heavily used by prior riders, as the bike already had a few thousand km on the dash and grip was exceptional. Within a few minutes though I had settled in, the front forks are soft and non-adjustable which means it pays to ride smooth, hooning up to speed in the heavy traffic only to brake heavily upsets the bike with dive in the forks. On the other hand the rear shock – a Kayaba unit with preload adjustment was quite stiff, although I only really noticed over speed bumps or really big potholes. Heading up the local twisties however I quickly discovered how well sorted the suspension was, providing perfect tracking and road holding on and off the throttle. 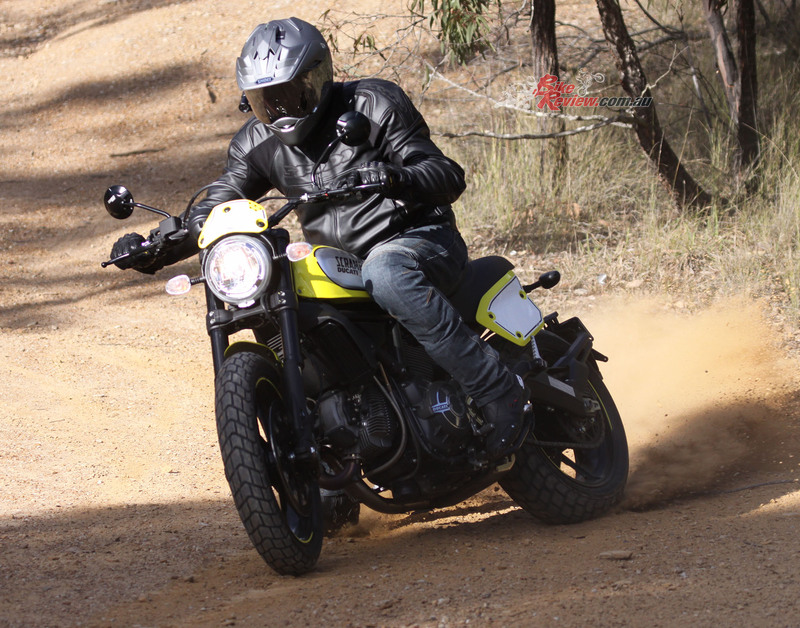 Where the Scrambler really excels is in providing torque laden performance and just rolling off the throttle provided enough engine braking that I was rarely doing more than touching the rear brake for a bit of stability through turns. In the 80 zones I was having fun carving up the corners – even staying relatively close to the speed limit, where on a sportsbike you’re constantly chomping at the bit to add at least another 20-40km/h to get that sense of fun, give or take an extra digit. Stringing together corner after corner was effortless, with the Scrambler proving extremely agile and responding to the smallest of inputs, holding the line of my choice without thought, in a fashion which left me increasing the speed corner after corner. The bike was just so planted and provided so much confidence there wasn’t a moment I didn’t feel like I could easily dial it up a few notches, but I was having so much fun I just didn’t need to. Riding smooth with minimal brakes and just playing with the torque and engine braking allowed very rapid progress and all in a manner that was fun and wouldn’t have me locked up. A run down the highway also proved enjoyable despite the lack of wind protection and the super-willing L-twin was a real surprise, in that I needed to keep a close eye on the speedo to ensure I didn’t find myself effortlessly and quite substantially breaking the 110km/h speed limits. The tall monkey style bars were a little high for commuting or extended open road riding but do allow a nice stretched out and relaxed riding position. I’d probably opt for something a bit lower and closer to me though if I was commuting regularly. Downshifting also required a heavier and more solid movement compared to upshifts which were effortless. Having gotten more used to the Scrambler’s appreciation of smooth riding the remainder of my time with the bike proved great as I rode smooth and avoided heavy acceleration followed by heavy braking when commuting through traffic, although with a bit of open road there was plenty of opportunities for fun when the traffic cleared. 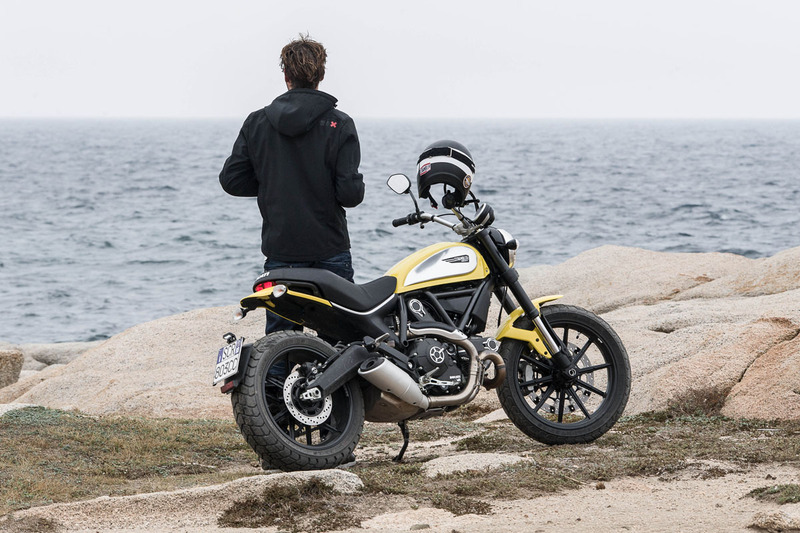 The Scrambler certainly left a lasting impression and if I was looking for something a bit more laid back than my everyday ride but capable of having plenty of fun on – without risking my licence constantly, the Ducati Scrambler would be top of my list. It’s a hoot to ride, has some awesome Ducati accessories that it would be hard to say no too and at $12,990 is great value. Plus the aftermarket industry has been going hell for leather producing accessories for the Scrambler, so there’ll be no shortage of options, regardless of what you want to do with your Scrambler. 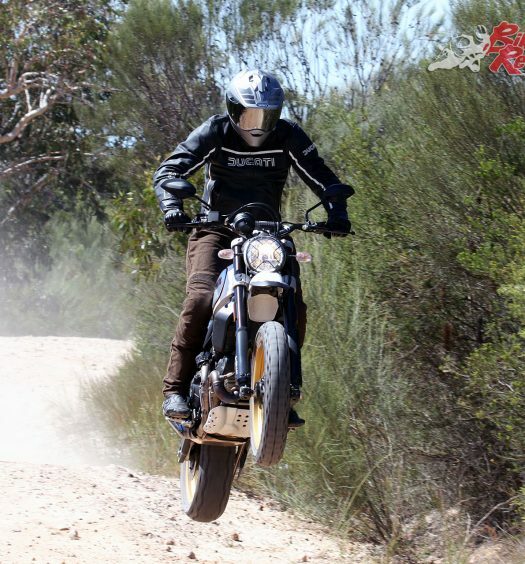 I’ve always been a bit skeptical of those who swapped from a sportsbike in order to preserve their licence or have fun at more reasonable speeds but now, having ridden the Scrambler, not only can I understand but also know exactly what they were looking for. Plus there’s a huge range of Scrambler branded gear available, if you like matching your clothes to your bike. 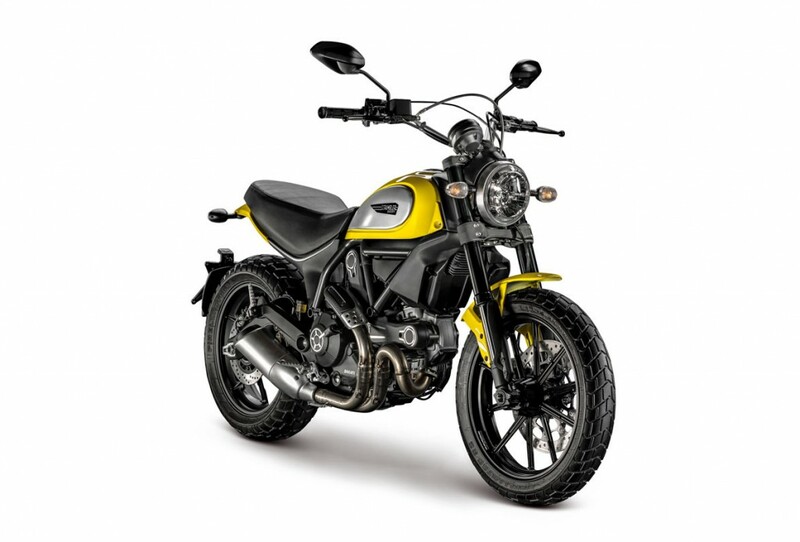 The Scrambler comes in four different models, the Icon as tested, the Urban Enduro, the Classic and the Full Throttle. 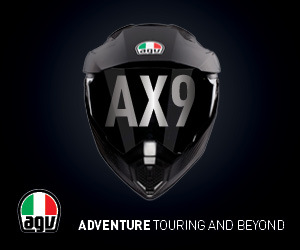 All feature a 13.5L tear-drop tank with side panels, dual sport tyres and a 18in front wheel ad 17in rear wheel. The Icon comes in ’63 Yellow and Ducati Red and features 10-spoke light-alloy wheels, a black Ducati branded seat, with aluminium fuel tank covers. The Urban Enduro is available in Wild Green, has a ribbed seat, different aluminium fuel tank covers, fork protectors, a higher front mudguard, off-road ‘bars, headlight grill, skid plate and spoked wheels. The Classic also has spoked wheels, is available in Orange Sunshine and comes with a ‘Vintage seat’, aluminium guards and a rear guard mounted licence plate holder. The Full Throttle comes in Deep Black with black tank panels, an even shorter front mudguard, race inspired seat and Termignoni muffler, plus flat track style bars and sporty tail. The Scrambler Icon is $12,990 + ORC, the Full Throttle, Urban Enduro and Classic are 14,990 + ORC. 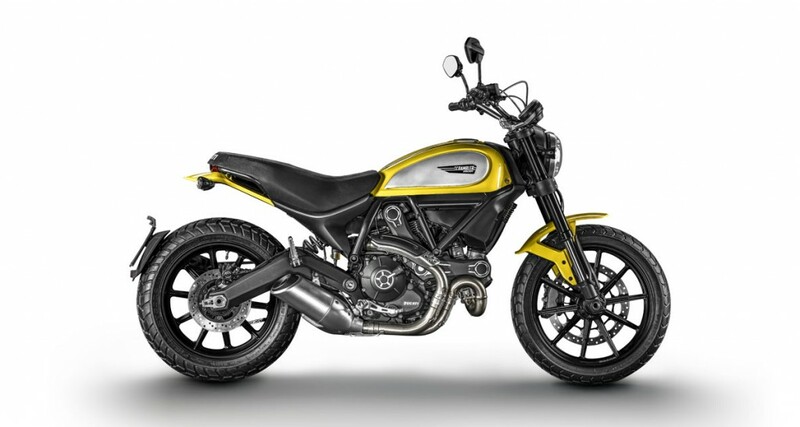 The Ducati Scrambler comes with ABS as standard and weighs just 170kg dry. It produces 75hp and 50ft-lbs of torque from it’s 803cc air-cooled L-twin Desmodromic, two-valves per cylinder engine. The engine is derived from the Monster 796 engine but with 11 valve overlap angle, and redesigned cams for linear power. 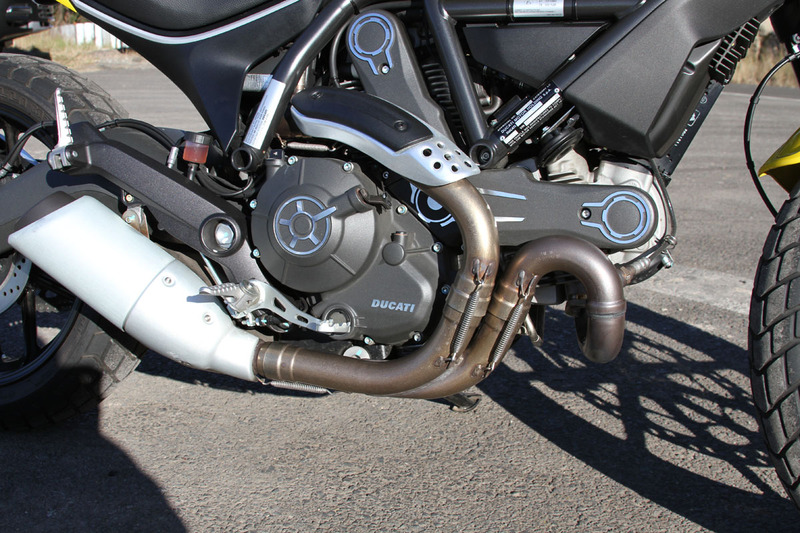 The exhaust on the Icon is a stainless steel muffler with an aluminium heat and silencer cover. Service intervals are 12,000km. The frame is a tubular steel trellis type, with die-cast aluminium two-sided swingarm, USD Kayaba 41mm forks, a Kayaba rear shock with preload adjustability and 10-spoke light alloy wheels – 17in rear, 18in front, sporting Pirelli MT 60 RS tyres. 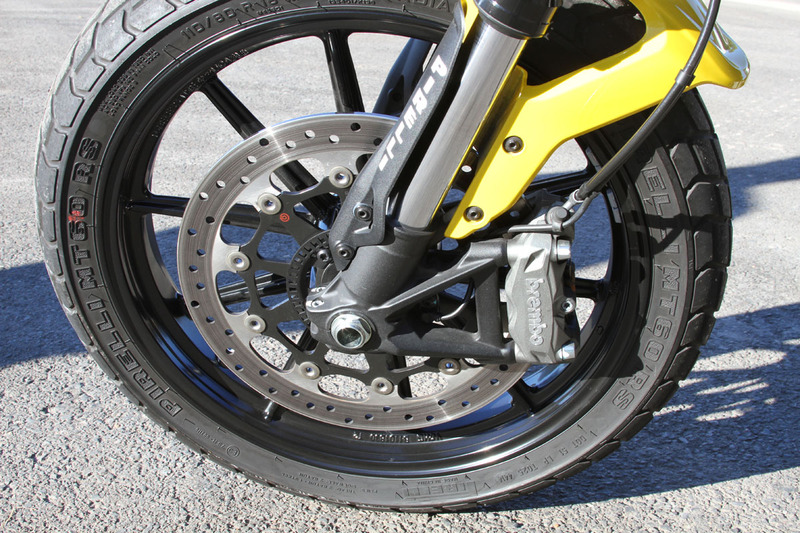 The single front brake is a Brembo four-piston caliper with 330mm rotor, the rear a single-piston floating caliper also from Brembo with 245mm rotor. Seat height is just 790mm with a 770mm lowered seat available as an accessory. The fuel tank holds 13.5L. 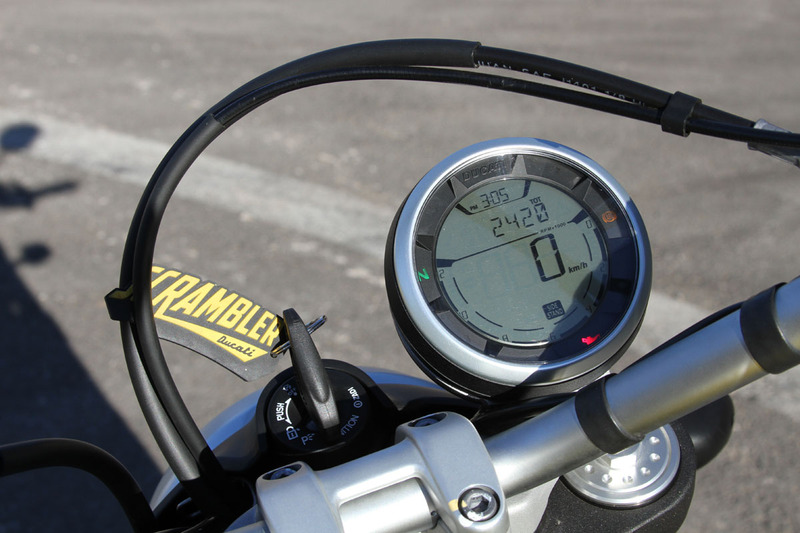 Instruments are LCD with interchangeable covers, a USB socket is available under the seat and the rear light is LED.